Unfortunately, as fragmentary as the sources on pre-Christian Germanic religion are, we know next to nothing about what the pre-Christian Germanic peoples thought of the Vanir as a group. “Vanir” is a rarely-used word. Its meaning is unknown. While there is a smattering of plausible evidence for the worship of Freyr, Freyja, and/or Njord outside of Scandinavia and Iceland, the title “Vanir” is never used in connection with them. Some have even questioned whether the Scandinavians and Icelanders themselves thought of Freyja, Freyr, and Njord as belonging to a separate clan known as the “Vanir” before the writings of the Christian historian and poet Snorri Sturluson. 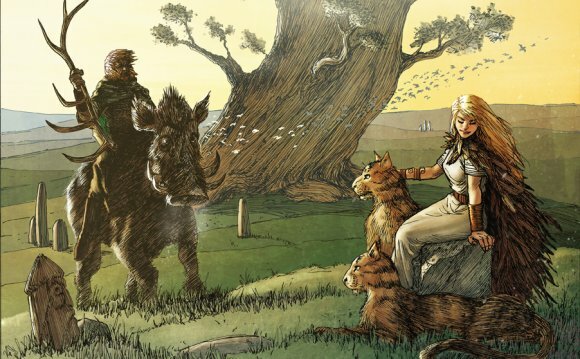 The Vanir do seem to be somewhat more associated with human and ecological fertility than the Aesir, but this is a vague tendency at best, and certainly not an absolute distinction; the Aesir god Thor, for example, had a large role to play in the fertility of the land and human society as well. Ultimately, all we can confidently say about the Vanir is that some late Norse literary sources portray them as being a group dimly distinct from the Aesir, and the gods and goddesses to whom the title “Vanir” has been applied were among the most widely and passionately venerated of the pre-Christian Norse deities.